We saw this no-brainer movie the other night called It's a Boy Girl Thing, which is pretty much a "Freaky Friday" movie. Anyway, I thought it would be fun to have a Freaky Friday style dinner, so I made some "Meat-Cakes" which consisted of little veggie meatloaves baked in a muffin pan, topped with mashed potatoes that I piped on with a pastry bag. I had intended to make a dessert that looked like a savory food too, but by the time the little Meat-Cakes were done I didn't feel like cooking anymore. I bet these are very kid-friendly! And this is what happens when someone is very lazy and doesn't feel like cooking dinner. 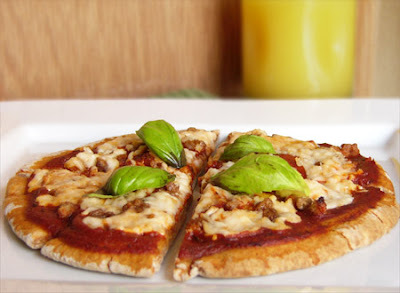 Today we had pita pizzas made with store bought pitas, pizza sauce from a jar, and some pre-shredded Vegan Gourmet cheese that I had in the freezer. Lazy! that is the most beautiful and delicious looking faux meatloaf I have ever seen. Tomorrow is my birthday and oddly enough I have been dying for faux meat loaf and mashed potatoes. Please say you'll come over and make my meal look like that! WOWOWOWOWOWOW. i'm really in awe. Now, on to the cookies. WHAT A COMPLIMENT from the Mr! (My hubby feels the same way, though I think he's biased). Of course you made the cookies also look beautiful as well as the eazy pizza! MMM I want to move in. Those little savory cupcakes look and sound amazing. I must try this recipe soon. Oh, and for a "lazy" dinner that pizza would be awesome. Question: you freeze your veg cheese? Any difference in texture? VeganView, whenever I buy a block of Vegan Gourmet, I shred the whole thing in the food processor and freeze it. I don't notice any difference in texture, maybe it's because it's shredded? 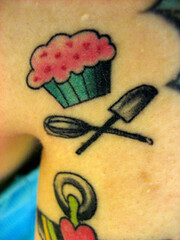 the mashed potato cupcake topping looks perfect! so fun. You are really talented. Martha Stewart watch out!!! more cookies! more cookies! I'm with you on that one. These meat cakes look to cute and perfect, what a genius idea! Who knew "meat cakes" could look so good?! I loved the piped mashed potato! I love your meatloaf presentation. Great idea! I've heard a lot about those cookies...I'll have to give them a try. Pizza is always a winner! Those are hilarious! They remind me of a few April-Fool-themed cupcake ideas I saw in a book called "Hello Cupcake". There were ideas for spaghetti cupcakes, popcorn cupcakes, chicken drumstick cupcakes, etc. And it all looked so real! noth'n wrong with some pita pizzas! yours look especially tasty! now i want PIZZA! 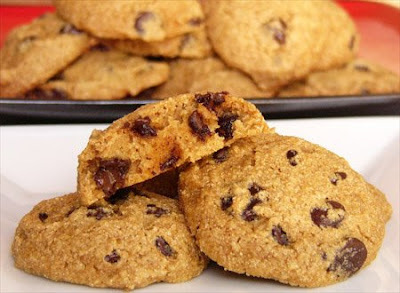 sweet cookies - they look sooooo good! I had to laugh when I saw your "meatcakes!" My mom used to pick up meatcakes from the deli when she didn't feel like cooking in the summer. They were not like meatloaf but very dense. Can't imagine what they were made of - probably every bit of old leftovers just shy of being thrown out. I'll bet yours are much tastier - love that mashed potato topping! What a cute idea! I love the mashed potato frosting! And I can't wait to try Happy Herbivore's recipes. I'm waiting until after the move really dig into it...but the corn dogs are calling my name! And does FYH cheese freeze well? I've never even thought about doing that. Ok...I'm a retard. Now I see you already answered the cheese question. I may give that a try. Such kind comments! Thank you! Bianca, a whole block of VG lasts me about a month or more. I used to have to throw away a bunch of it until because after just a few days in the fridge it got moldy. The guy from our local health food store suggested shredding it and freezing it, and it works like a charm! That pizza looks like it took a lot of effort to make. Not lazy at all, but definitely drooool-worthy! And the cookies look divine! Are you writing a cook book? If not, you should. 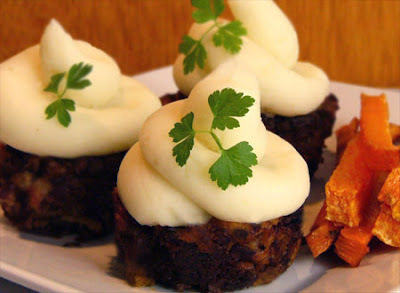 The meatloaf-cupcake idea is genius! Thanks for giving me the Oatmeal Queen title! I think if I could give myself a title, that'd be it, because I just love oatmeal so so much. Is it possible to have too much oatmeal? I hope not! Holy cow--PLEASE come cook for me! !